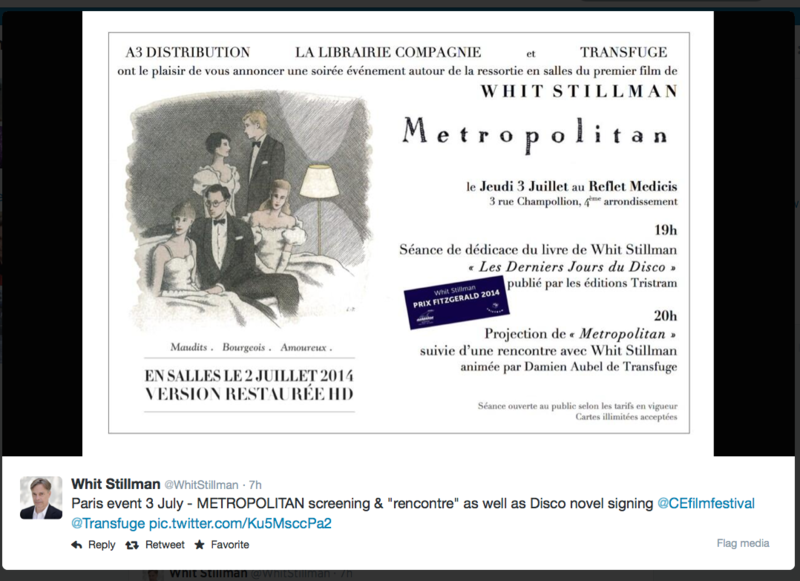 Metropolitan du Whit Stillman en salles le 2 Juillet 2014. Special voire 3 Juillet. Whit Stillman présents pour signer son livre qui vient de remporter Prix Fitzgerald. Whit Stillman is interviewed by Talia Soghomonian at Collider in an interview that touches on his movies, being honored in France, writing tips, John Ford, the release date for The Cosmopolitans, a deleted scene from Metropolitan (I believe it has never been discussed until now) and his upcoming Jane Austen project Love and Friendship (which he hopes to start filming in September and October). 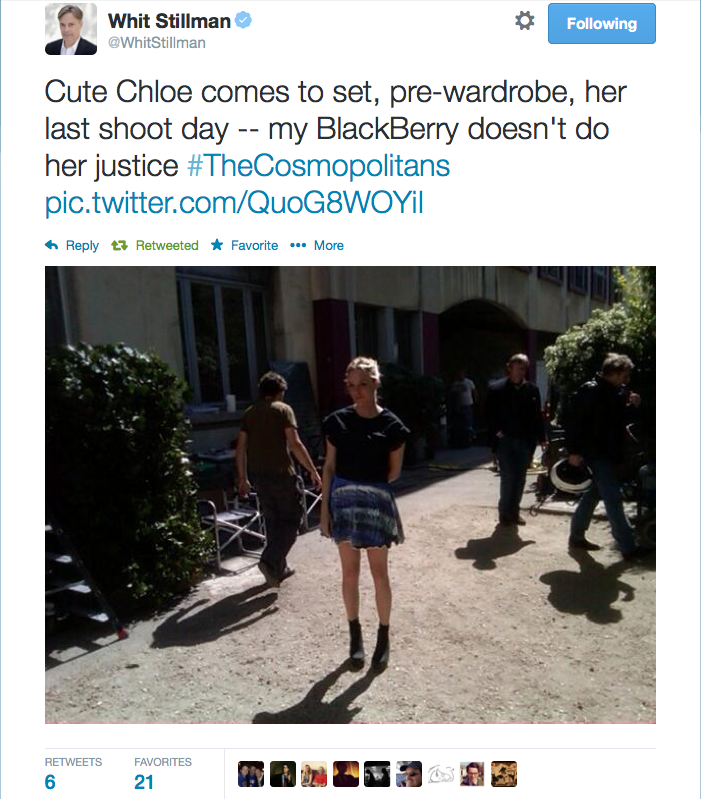 Stillman states that The Cosmopolitans will be coming out on Amazon in the USA and England at the end of August. Imdb has also changed their release date to “not yet released” instead of June 30th. It is a great read and one of the most thorough articles on Stillman that I have seen in a while. “I think it’s the struggle of the screenwriter to find material that resonates with the screenwriter and maybe with the public. And it’s finding the characters who then come alive and tell a story,” he says. The first film he ever saw was Bambi, the last movie which made him cry was Gold Diggers of 1935, directed by Busby Berkeley, and he regrets he never got the chance to direct Cary Grant in a film. While he considers Jean Cocteau as the ultimate artist, he is also a John Ford fan. 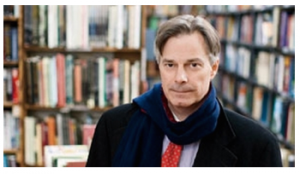 Here is the French trailer for Whit Stillman’s Metropolitan. It is the highest quality trailer of Metropolitan on the internet. Metropolitan is also being released in France on July 2, 2014. Tom Townsend rejoint le cercle restreint de la bande d’amis de Sally Folwler. New-yorkais, bourgeois et cultivés, toutes les nuits, ils se réunissent pour tromper l’ennui, parler politique, deviser sur leurs histoires d’amour et autres problématiques existentielles. Bienvenue dans la “Urban Haute Bourgeoisie”. Whit Stillman snapped this photo with his BlackBerry of the talented Chloe Sevigny. It was her last day of filming. 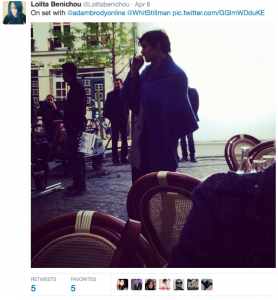 Whit Stillman est le tournage de “The Cosmopolitans” à Paris, il est donc naturel de poster des liens en Français. Aussi, où vous pouvez obtenir ses films sur DVD en Français. Amusez-vous! The Cosmopolitans : Adam Brody et Chloe Sevigny s’expatrient à Paris !